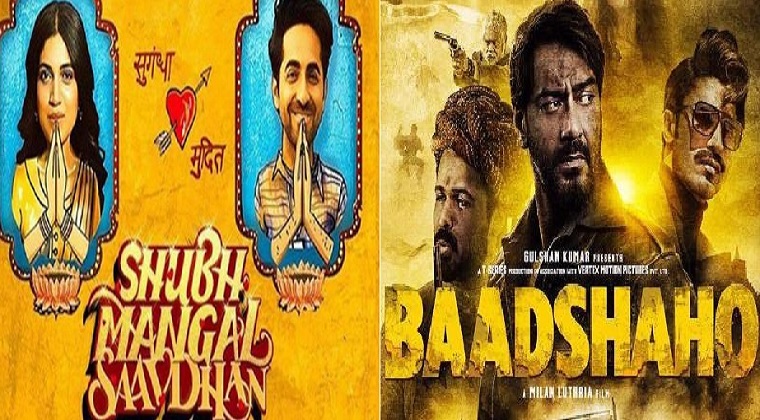 Bollywood films ‘Shubh Mangal Saavdhan’ and ‘Baadshaho’ have removed box office chaos for some time now. Both films have done a good business in their opening weekend. ‘Shubh Mangal Saavdhan’ has earned Rs 14.46 crore and Baadshaho opening weekend box office collection was Rs 43.30 crore. Directed by Milan Luthria ‘Badshaho’ stars Ajay Devgan, Iliana Dikruz, Emraan Hashmi, Isha Gupta and Vidyut Jamwal, earned Rs 12.60 crore on the first day of its release. The film earned Rs 15.60 crore on Saturday and Rs 15.10 crore on Sunday. #Baadshaho fared well in its opening weekend… Fri 12.60 cr, Sat 15.60 cr, Sun 15.10 cr. Total: ₹ 43.30 cr. India biz. The movie ‘Baadshaho’ is based on the background of the emergency. At the same time, the beginning of ‘Shubh Mangal Saavdhan’ starring Ayushmann Khurana and Bhumi Pednekar, based on “erectile dysfunction” of men, was a bit slow. The film earned only Rs 2.71 crore on Friday. However, the film received a good response during the weekend and on Saturday it earned 5.56 crore rupees and on Sunday earned Rs 6.19 crore and received praise from the audience. #ShubhMangalSaavdhan showed strong trending… Fri 2.71 cr, Sat 5.56 cr, Sun 6.19 cr. Total: ₹ 14.46 cr. India biz. Market reviewer Taran Adarsh posted on Twitter on Sunday, “Money is being raked up at the box office. On Saturday, Eid festival holidays gave rise to the two films ‘Baadshaho’ and ‘Shubha Mangal Saavdhan’. This year, many big films such as ‘TubeLight’, ‘Jagga Jasoos’, ‘Munna Michael’, ‘Jab Harry Met Sejal’ and ‘A Gentleman’ have not been successful at the box office. Prior to ‘Baadshaho’ and ‘Shubh Mangal Saavdhan’, Akshay Kumar and Bhumi Pednekar starred ‘Toilet: Ek Prem Katha’ received positive feedback in the box office earnings.